After many years of bread making, I have finally learned (thanks to Sara at Cotna Eco Retreat) how to make sourdough this year - using a wonderful old starter made from organic rye flour and pure spring water. As usual, I've tweaked the original bread recipe just because I like to make things simple and we both prefer denser breads. I keep the starter in the fridge until ready to use, then add organic rye flour and warm water. And this is after around 8 hours. The starter gets added to the other bread ingredients and forms the dough. I use Shipton Mill organic flours and mix it up for variety. 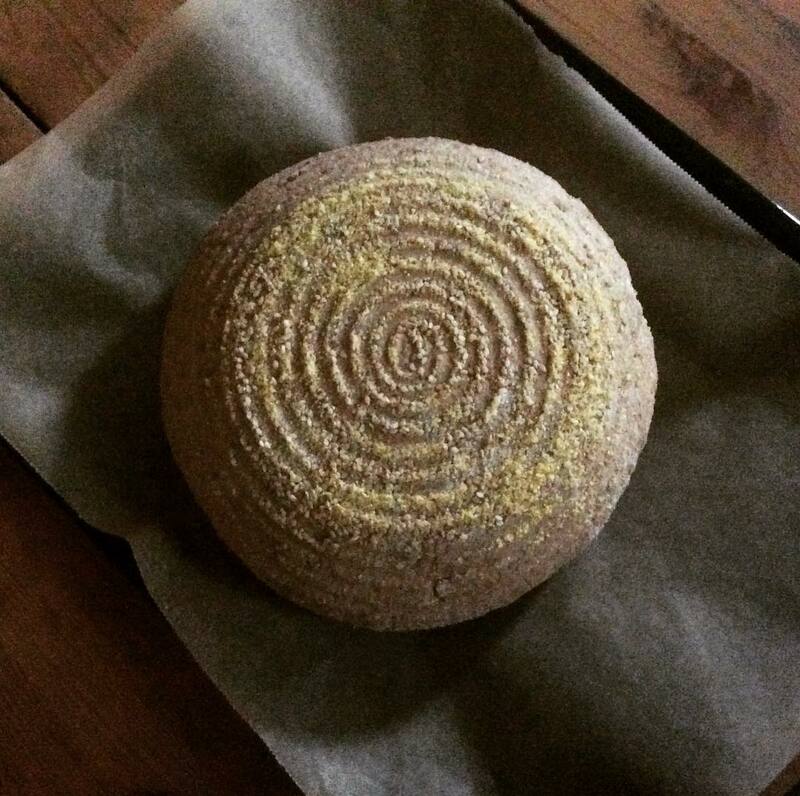 Our favourites are stoneground wholemeal, extra coarse wholemeal, wholemeal spelt, light malthouse and dark rye. This is how it looks after being left usually overnight. I like to use polenta and sesame seeds, instead of the traditional semolina. 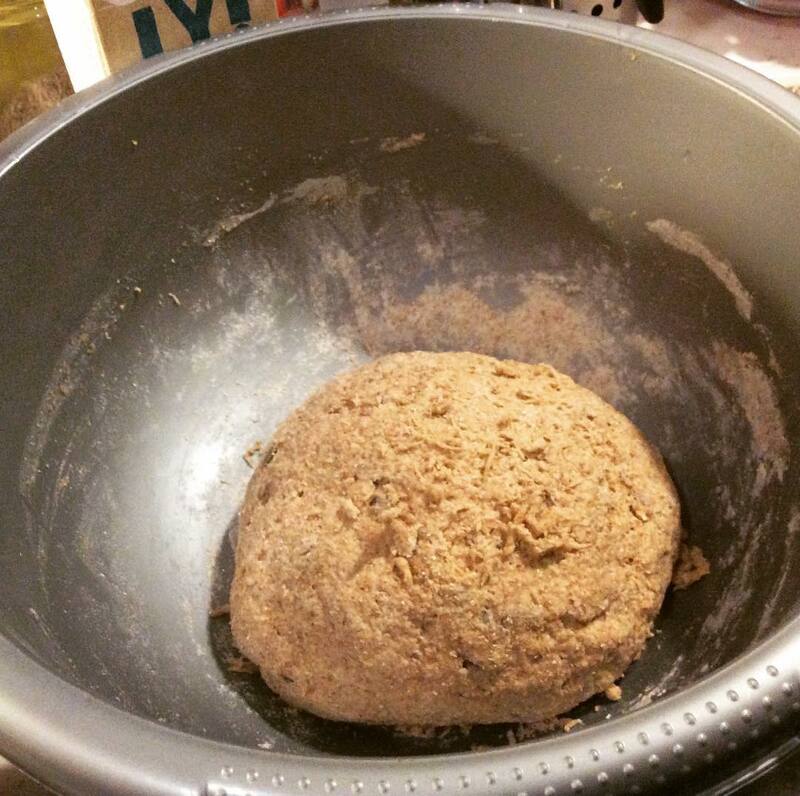 The dough after another gentle knead. This gets placed into the banneton upside down. Turn the dough out on to a baking sheet. Put a slit in top and I usually sprinkle with water before putting in the oven. But it still tastes great!!! I am lucky to have been given a 100 year old starter which just needs feeding, but you can make a starter from 50% flour and 50% water... 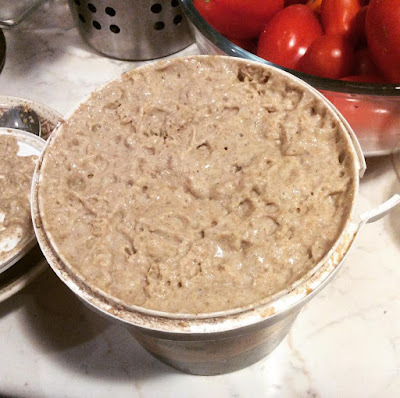 I would try 150g rye flour and measure out on the scales the same amount of warm (body temp) water. 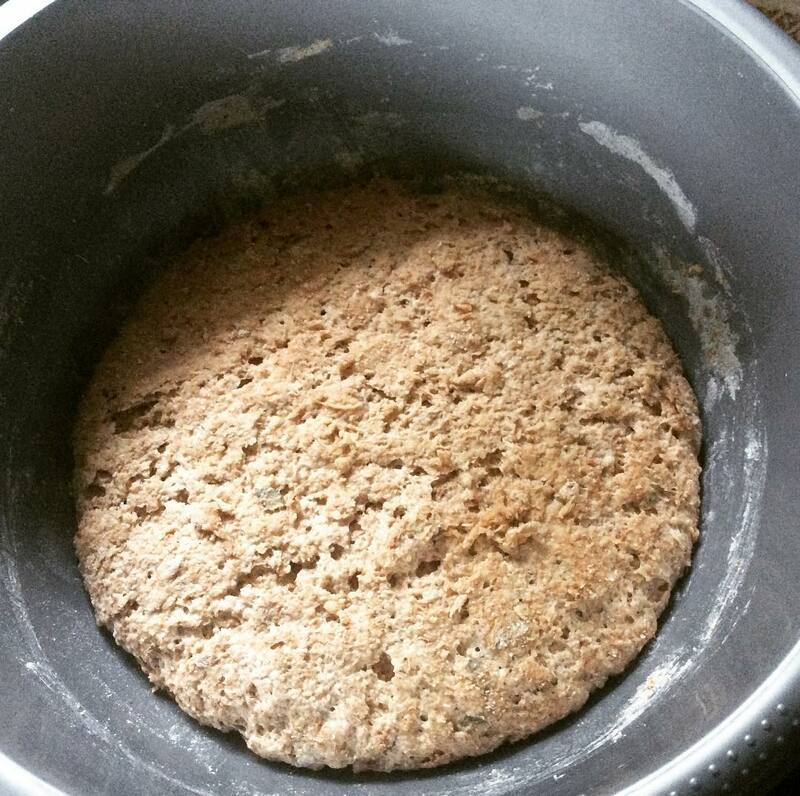 Leave out for a couple of days, then feed it with the same ingredients again and leave until it's really active. At this point it's ready to use. Into a large mixing bowl put 500g bread flour (can be just one flour or a mixture of your favourites). Add approx 2 tbsp seeds - I use pumpkin and sunflower mostly and approx 3 tsp sea salt. Mix together. Add 250g starter (and put the remainder of starter in the fridge for next time) and measure out on the scales 300g warm water (again body temp). Mix all the ingredients together into a dough, firstly with a metal spoon and then use your hands. There are lots of videos to watch about kneading bread, so go for it! 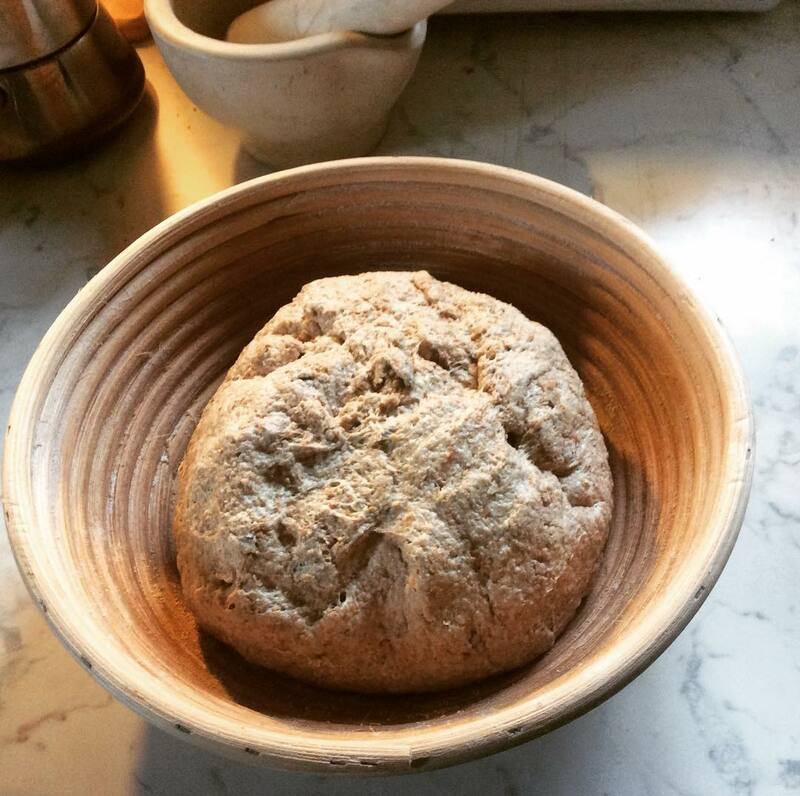 I knead the bread in the bowl just for simplicity and sometimes need to add extra flour if the mixture is too wet. Leave the dough covered with a damp tea towel for several hours (overnight is good) in a cool place. 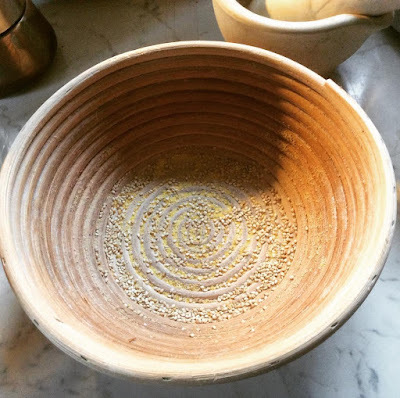 Prepare a banneton...sprinkle semolina or polenta into the grooves and I like to add sesame seeds too.You can also use a loaf tin - line it with baking paper. Gently fold the dough into the shape you require and if using a banneton, pop the dough in upside down. If using a tin, just put it in the right way up. Leave covered for another couple of hours ...I usually do this stage early in the morning, so we have fresh bread for breakfast. Put your oven on 240C or Gas 8, turn the dough out of the banneton on to a lined baking sheet and if using a loaf tin - leave it in. Slit the top and either lightly sprinkle with water or put a dish of water into the bottom of the oven. Bake in the oven for 20 minutes, then rotate the loaf and turn the temperature down to 180C/Gas 4. Bake for another 25 minutes. Remove from the oven and leave to cool...it's ready to eat after around 15 mins.